FORMER Rangers goalkeeper Andy Goram has hit out at the Scottish government’s handling of Scotland’s bigotry shame, claiming it can never be fully eradicated. Speaking exclusively to The Cardonald Courier, Goram said the Old Firm “shame game”, which saw Rangers and Celtic managers Ally McCoist and Neil Lennon almost come to blows in March last year, was blown out of proportion and claimed the country’s bigotry problem was not getting worse, but better. “It’s certainly been improving, that’s a fact, but you look at what happened, the way they blew it out of proportion with Neil Lennon and Ally McCoist,” he said. “If Ally McCoist had stuck one on Neil Lennon’s chin or vice versa then you have a problem, but it’s absolutely pathetic. “There were no punches thrown, and then it was all over the government and the Scottish parliament. There’s a lot more things going on in Scotland than that to provoke the reaction they provoked from the Scottish government. In March last year Glasgow’s SECC played host to a Premier League darts match between Adrian Lewis and Gary Anderson, during which Lewis was hit by a pint of lager and struck by coins thrown by the 6,500-strong crowd. Controversy surrounded Scottish football in 2011 after Celtic manager Lennon and prominent Celtic fans Paul McBride QC and Trish Godman MSP were targeted with viable parcel bombs which Strathclyde Police said were intended to “kill or maim”, raising fears that sectarian tensions in the west of Scotland were reaching boiling point. Lennon was also attacked by a football fan on the touchline during a game between Celtic and Hearts at the height of the league title run in. Events on and off the pitch led the Scottish government to push through new legislation in December designed to tackle Scotland’s sectarian problem. Scottish Minister for community safety Roseanna Cunningham said: “Sectarianism is never acceptable, never excusable. It has ruined the lives of too many people and too many communities for long enough. Goram welcomed the latest attempts to curb bigotry in Scottish football, but said it would never be eradicated: “I think back to the 90s when I was playing – everyone could sing the songs at the Old Firm games and that was accepted then but now it’s not acceptable, which is fine, so anything that’s going to help try and promote that has got to be a help. Celtic and Rangers have both been fined by UEFA over fans’ chanting in European fixtures, but Goram said the clubs were doing all they could to fix the problem. “I think the clubs are doing a great job. I think a lot of their fans around about all the people singing are doing a great job. Despite Strathclyde Police figures showing an increase in domestic violence rates following Old Firm match days, Goram believes the connection between the two is exaggerated. Domestic abuse incidences rose 75% compared to the previous week on the day after an Old Firm game on February 20 2011, prompting Lord Advocate Frank Mulholland to warn of a clear link between the rival matches and domestic violence. 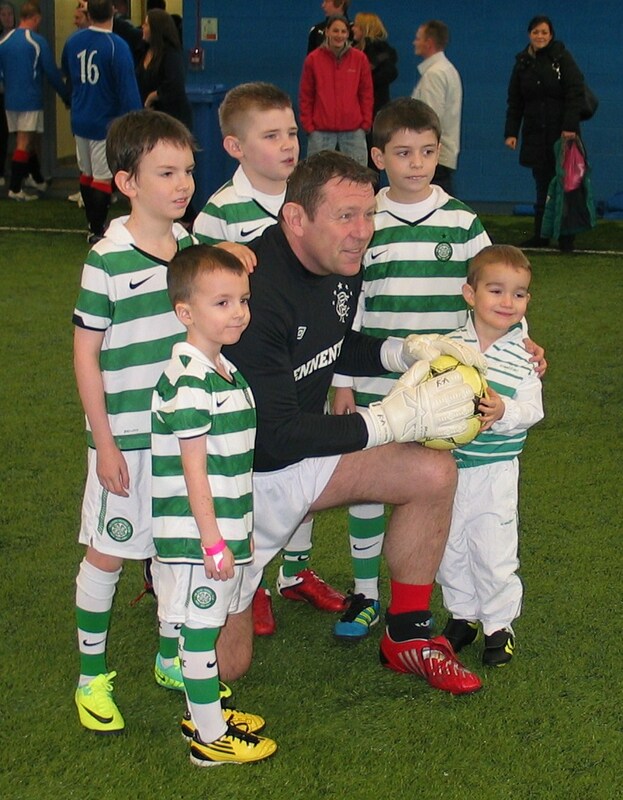 Goram was speaking after a recent Old Firm Legends match at Toryglen Regional Football Centre, which saw former Scottish football stars Frank McGarvey, Jose Quitongo and Charlie Miller take part. Old Firm Legends organises matches and distributes its proceeds to a range of Scottish charities. It is now working alongside Facebook campaign Rid The Old Firm Bigotry Once And For All, set up by Celtic fan Colin Dolan after he witnessed sectarian abuse between Rangers and Celtic fans on a number of sports-related social networking pages. In 2010-11, 693 charges involving a religious aggravation reached Scottish courts, with over 50% of cases occurring in the Glasgow area. Football was involved in 231 of the charges, while 32 were related to marches or parades. Despite the statistics, Goram said there were more pressing issues in Scotland than the problems posed by bigotry but warned fans that it would no longer be tolerated. Rid The Old Firm Bigotry founder Dolan said more should be done to tackle the problem: “There shouldn’t be a problem,” he said. “The bigotry problem should have been dealt with years ago in my opinion. I always thought the SFA [Scottish Football Association] would come out and say something to stop it but they didn’t. They didn’t change any rules. They didn’t fine any club, didn’t take any points. Nothing was being done. “There is a type of bigotry that is within the support of Rangers and Celtic. There is a particular brand of bigotry that is embodied within the support.